When I sit and think about reality being reflected onto the screen, I generally lean towards an approving notion of that idea. The attempt to meld the hum-drum activities of daily living and interpret them as drama for a hopefully receptive audience is an impressively staggering challenge. Let's face it, real life is kinda boring, until it's not, but most of the time...it's a slow, steady ride, regardless of varying circumstances. Jim Jarmusch's latest, Paterson, is an acute reflection of that effort. It's about a man (Adam Driver) whose everyday follows the same pattern. He drives a bus, carting passengers in Paterson, NJ to and fro, eats lunch by a waterfall, goes home, eats dinner with his artistic wife, and then walks the dog before heading to a bar to have a drink and shoot the breeze with the owner and its various patrons. In the margins of his day, he writes poetry, with a particular interest in the stylings of William Carlos Williams, whose most notable work is named after the very same city in which this film unfurls, which also shares the name of the film's star. There's something about the way Paterson (the character) employs his artistic talent that's imminently relate-able. He works through his muse on a journal in between his bus route, lunch, and just before his wife comes home from whatever latest artistic venture is her wont. She urges him to publish these poems, of whose quality I'm not really qualified to judge, and attempt to make a living doing something he loves. But Paterson just sort of smiles, and moves on with his day. This is both understandable, yet also slightly regrettable in a way. It's a unique understanding of how the part-time or volunteer artist finds self-satisfaction through writing though they support themselves in ways that simply carry them from Point A to B. But, does that allow the artist to reach their fullest potential? Is there any obligation, even to one's self, to share this gift with the world on a broader canvas? Paterson (the film), asks that question in small parts, though never in an outright effacing way. Instead it colors in Paterson's world with his day to day details. One day he might overhear a conversation from two college students on his route regarding socialism, another may see him talking with a broken hearted man at the bar, another may find him discussing dog-jacking as "something he can look forward to". Paterson is a weirdly contradictory character, both trapped in his ongoing existence, but also settled into it to a point where he feels uncomfortable with any kind of change at all. But he's never truly sad, or expresses anything beyond mild perturberance, even when a slight tragedy strikes. He just keeps on moving, with as pleasant a demeanor he can muster. The acting challenge in front of Driver had to be immense, but he continues to showcase just why he's one of the rising young acting talents of this generation - imbuing a lived in character, full of experience, but never wearing it so heavily in his actions or reactions that it never breaks that boundary of reality. It's an exquisite performance of tiny adjustments. Before I saw this film, an online acquaintance exclaimed that this is a film that builds off of everything Jim Jarmusch has done before, and my first thought coming out was, this is only a film he could have made. Taking the micro-story approach of Night on Earth and Coffee and Cigarettes, the introspection of Broken Flowers, and the intimate travelogue of a working a class city center from Only Lovers Left Alive, and it would give you a sense of the canvas Jarmusch is playing towards with Paterson. Does it always work? Not quite, there's a bit of drag that will be cause some viewers to see the back of their eye-lids, particularly if your tolerance for non-rhyming prose is low, and his the Laura character (played by Golshifteh Farahani) veers far into "manic pixie dream girl" territory. In one way, it could be argued that she's the perfect counter-balance to Paterson's reluctance to embrace his talent, at the same time, her presence is perhaps just so ever off the mark that it veers into what Jarmusch thinks the typical artistic temperament actually is. I still haven't personally come to terms with how I feel about that aspect, and I saw this movie two months ago, I'll probably wrestle with it forever. But at the very least, it has a really cute dog. 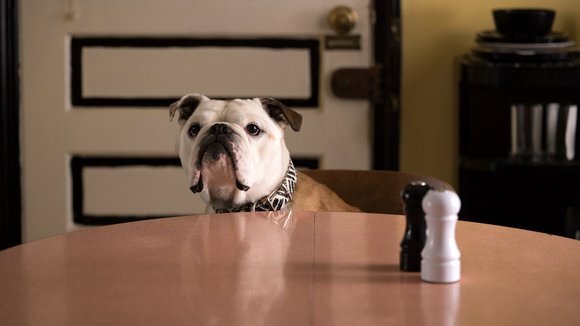 Maybe the cutest dog in a film in quite some time. The bottom-line is, it's a step down from the remarkable Only Lovers Left Alive (probably still Jarmusch's best film) but recommendable for those who are already on-board with the filmmaker. I'm not sure how much further that appeal stretches, especially for a film with no rising action at all. But if you're an audience goer that's interested in what modernist poetry may look like in motion, for better or worse. The whole doesn't quite come together, and it ends about as unassuming as it begins, but like in real life, the smaller moments sometimes click and resonate long after its running time has past.